Werewolf: the Apocalypse is about anger over the loss of what the shapeshifting werewolves (the self-named Garou) hold dearest: Gaia, the earth itself. Corruption from without and within has caused the destruction not only of the Garou’s environment, but also of their families, friends and culture, which extends in an unbroken line to the very dawn of life. No matter how righteously the garou hold themselves, no matter how they prey on their destroyers, the corruption spreads. Now the time for reconciliation is past. This grave insult against Gaia can end in only one way: blood, betrayal… and rage. Contained within Werewolf the Apocalypse: Fang & Claw Volume 1 are stories of three of the thirteen different werewolf “tribes” (societies), a trilogy of bone-breaking and heart-wrenching action tales that will leave you in a pool of your own sweat! This volume contains the critically acclaimed first three graphic novels: Black Furies, Bone Gnawers, and Children of Gaia. 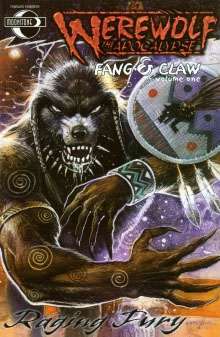 Werewolf the Apocalypse: Fang & Claw Volume 1 is available at DriveThruComics.com! This is the first time this collection has ever been presented in eBook format! Check out all of the Vampire and Werewolf comics available now from Moonstone Books at DriveThruComics.com.